The Technical University of Berlin (Berlin Institute of Technology, TUB, TU Berlin, German: Technische Universität Berlin) is located in Berlin, Germany. 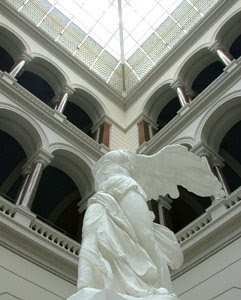 It was founded in 1879 and, with nearly 30,000 students, is one of the largest technical universities in Germany. It also has the highest proportion of foreign students out of universities in Germany, with 20.9% in the summer semester of 2007, roughly 5,598 students. The university alumni and professor list include eight Nobel Prize winners. 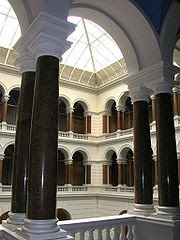 he institution was unified in 1879 under the name Royal Technical College of Charlottenburg (later Berlin) by merging the Building Academy (Bauakademie), established in 1799, and the Vocational Academy, established in 1829. Since 1916 it has been integrated with the former Mining Academy, which was the oldest institution, founded in 1770. The college was closed after World War II on April 20, 1945 and the university re-opened on April 9, 1946 under its current name. "The university’s reopening in 1946 was purposely conceived as a new beginning, so as to make a clear break with the National Socialist past. This fresh start was also to be expressed in its new name: as Germany’s first technical university it was named simply “Technische Universität”. Its educational mission was reallocated as well with an emphasis on “universal education”. By including the Humanities in its compendium of subjects, the TU Berlin became the first technical university in Germany to present a humanistic element in its scholastic profile. The aim was to breach the gap between technological research and social responsibility. The challenge of gaining insight into interaction between society and technology remains an important issue even today. Right from its inception, the TU Berlin was open to embracing reforms and innovations. Fundamental changes within the German university system eventually led to the student movements of the late 1960s. 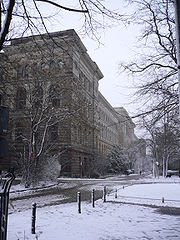 Given its central location, the TU Berlin was often the focal point of student activities in Berlin during this time frame. The 1960s and 1970s were characterized by a significant expansion of German universities, with the number of students attending the TU Berlin increasing accordingly. Forthermore, parts of the former Pädagogische Hochschule (college of education) Berlin were merged with the TU Berlin on April 1, 1980. Since the 1980s, however, universities have also felt the direct impact of public funding constraints. The fall of the Berlin Wall prompted a sudden explosion of science and research capacities in Berlin, with costs rising as a result. Initiation of the so-called University Contract Agreement (Hochschulverträge) posed a real challenge to the Federal State of Berlin. Since the late 1990s, this agreement provides financial planning security to universities, but in return demands that they adopt a number of reforms. The TU Berlin has consistently met these challenges by adopting lean, modern university administration practices, by modifying the scholastic program to fit our Bachelors/Masters program and by ensuring excellence in research.